Make yourself at home in one of the 128 guestrooms featuring minibars. Complimentary wireless Internet access is available to keep you connected. Private bathrooms with showers feature complimentary toiletries and bathrobes. Conveniences include phones, as well as desks and complimentary weekday newspapers. A stay at Campanile Lublin places you in the heart of Lublin, within a 10-minute walk of Lublin Conference Centre and Centre for the Meeting of Cultures. 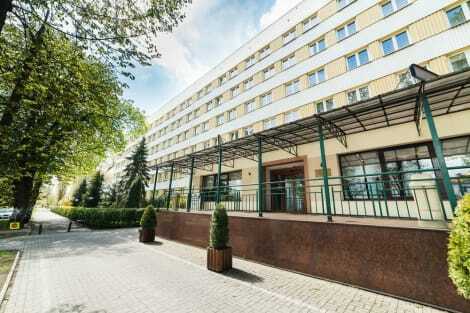 This hotel is 0.5 mi (0.8 km) from Lublin Plaza and 0.6 mi (1 km) from Henryk Wieniawski Lublin Philharmonic. With a stay at Hotel Na Rogatce in Lublin, you'll be within a 10-minute drive of Maria Curie-Sklodowska University and Catholic University of Lublin. This hotel is 1.3 mi (2.1 km) from Lublin Conference Centre and 1.3 mi (2.2 km) from Centre for the Meeting of Cultures. Make yourself at home in one of the 72 air-conditioned rooms featuring refrigerators and LCD televisions. Complimentary wireless Internet access is available to keep you connected. Conveniences include desks and minibars, and housekeeping is provided daily. Make yourself at home in one of the 105 air-conditioned rooms featuring minibars and LCD televisions. Complimentary wireless Internet access keeps you connected, and cable programming is available for your entertainment. Private bathrooms with bathtubs or showers feature complimentary toiletries and hair dryers. Conveniences include phones, as well as safes and desks. Vanilla is housed in a 17th century historic building and offers accommodation in elegant rooms with free WiFi. It is located only 150 metres from the beautiful Old Town. Each room at Vanilla is air-conditioned and features stylish interior design. Guests can enjoy a TV with cable channels. There is also a private bathroom with shower and hairdryer. Extras include a safe and a phone. The hotel restaurant and the café serve international cuisine, coffee and sweet desserts. A vast selection of drinks can also be enjoyed. The property is situated 400 metres from the bus station and 2 km from the railway station. There is a 24-hour front desk service. The paid, private parking is located 70 metres away. lastminute.com has a fantastic range of hotels in Lublin, with everything from cheap hotels to luxurious five star accommodation available. We like to live up to our last minute name so remember you can book any one of our excellent Lublin hotels up until midnight and stay the same night.